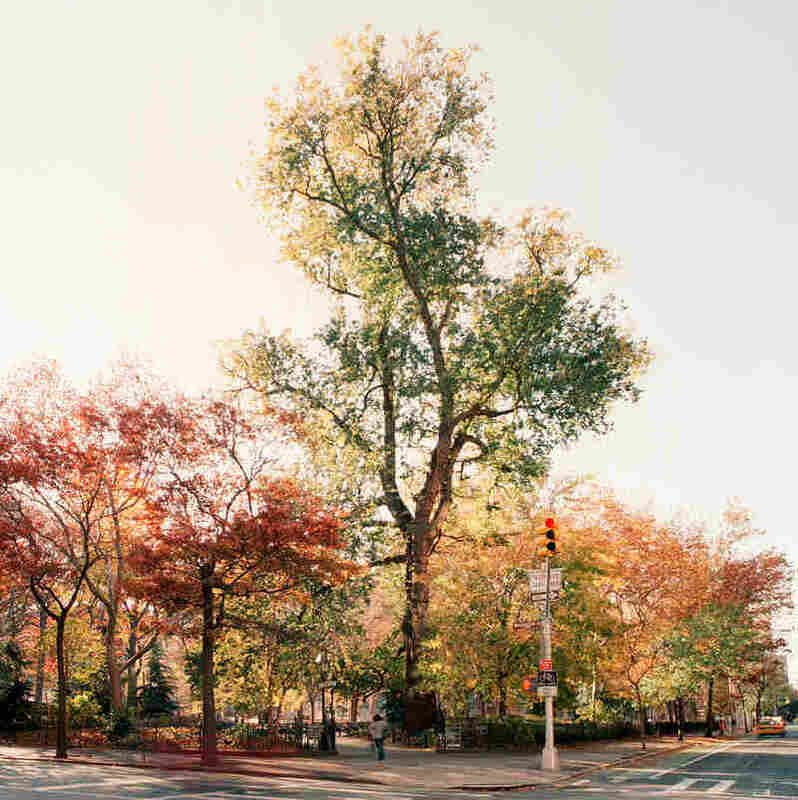 New York: A Concrete Jungle And 'City Of Trees,' Too People generally don't associate trees with New York City, and if they do, they tend to think only of Central and Prospect parks. But the city is filled with old, beloved trees, some dating back more than 200 years, many of them located in the unsung outer boroughs. Tulip tree in Alley Pond Park, Queens, taken on Nov. 4, 2005. When it was last measured, it stood 134 feet tall. Cedar of Lebanon in Weeping Beech Park, Flushing, Queens, taken on July 28, 2010. The multiple trunks had a combined diameter of 100.5 inches. The height was approximately 30 feet. The tree is about 120 years old. English elm in Washington Square Park, Manhattan, taken on Nov. 18, 2011. The tree had a diameter of 65 inches and an estimated height of 110 feet. The tree was about 220 years old. Katsura trees in Kissena Park, Queens, taken on May 21, 2009. The multiple trees — originally planted as saplings in a nursery row — are now fused together as a single tree. They're more than 107 years old. A southern magnolia in Bedford-Stuyvesant, Brooklyn, taken on June 3, 2010. The tree had a diameter of 20 inches and stood about 40 feet tall. The tree is 125 years old . 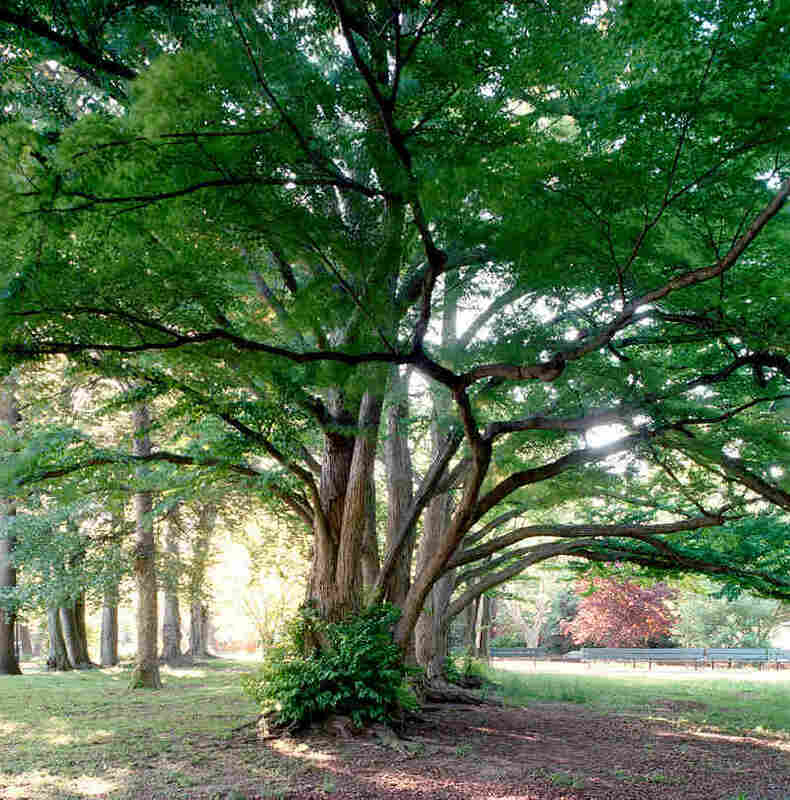 You expect to find great trees in city parks and botanical gardens. But you might not expect to find ancient or unusual trees in the inner city or smack dab in the middle of a highway. 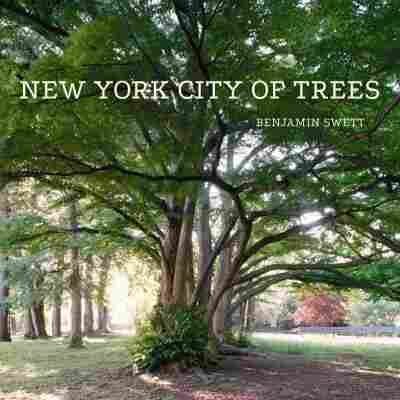 Benjamin Swett has a love of trees so deep that he's written pamphlets about them, created photo exhibits and now has a new book, New York City of Trees. His book has pictures and stories of some 60 trees in the city. I took a walk with him to some of the great trees, often in unexpected places. Swett first takes me to Alley Pond Park in outer eastern Queens. It's noisy. The park stands in the middle of the Long Island Expressway and several other highways. 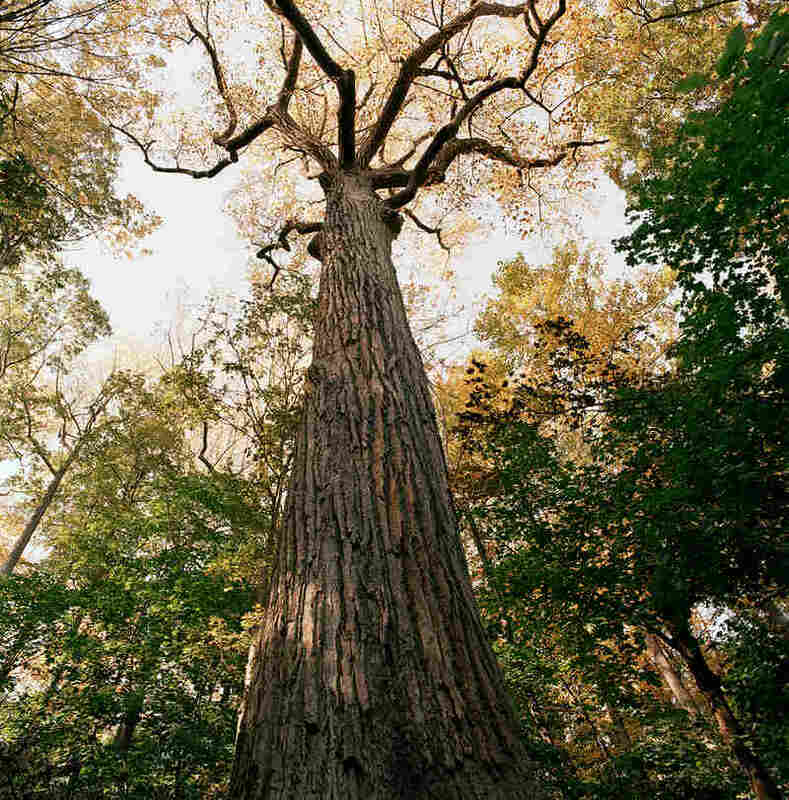 Swett points to what might be the tallest tree in Queens and tells me that tulip trees like this — along with white oaks and white pines — were the original tree-filled landscape when Henry Hudson arrived in 1609. "It comes out of the earliest times," he says. "It may not have started growing itself when Henry Hudson came, but it brings us back to the times when Native Americans lived in this area and when these woods were what the whole of New York City looked like." If you look down and up at the tree from a bluff on high, you'll see that it's huge. No one has cored it, so its age is unknown. But 13 years ago, when it was last measured, it stood 134 feet tall. You wouldn't expect the Bedford-Stuyvesant neighborhood in Brooklyn to be the home for unusual trees. But next to some nondescript brownstones there's a Southern magnolia. With its huge waxy green leaves and white flowers when it blooms, Swett says, it shouldn't even be here. "It is much too cold for it here," he says. "But we think that by literally hugging the side of this row of brownstones it received enough warmth to remain growing through all the severity of the northern winters." There's a mural on the wall dedicated to Hattie Carthan, who saved the tree when developers wanted to tear it down. 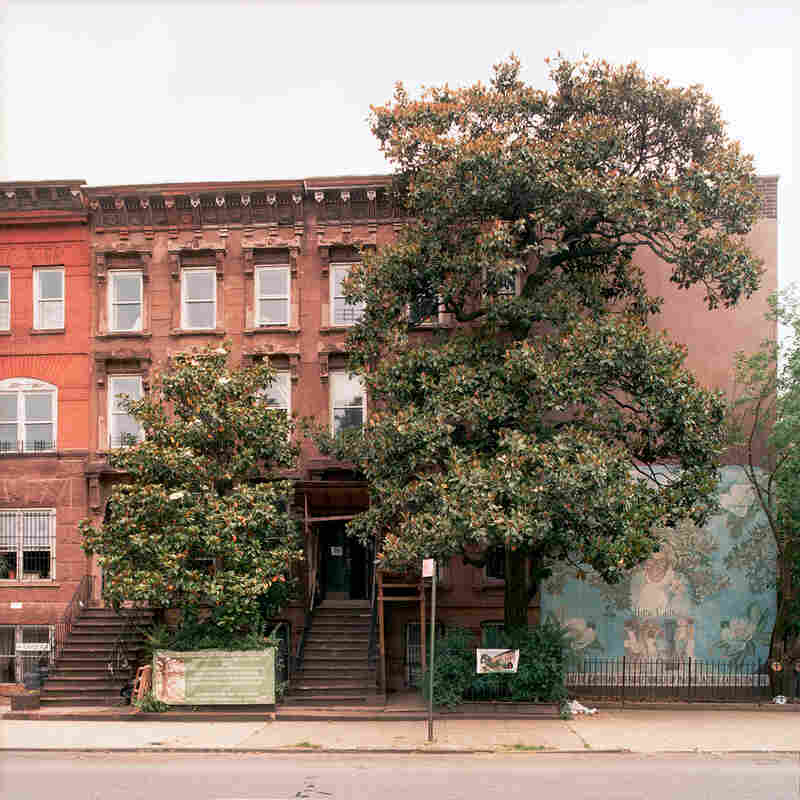 She convinced the Landmark Preservation Commission that the tree was so unusual it should be preserved along with the brownstones that protected it. And they were. 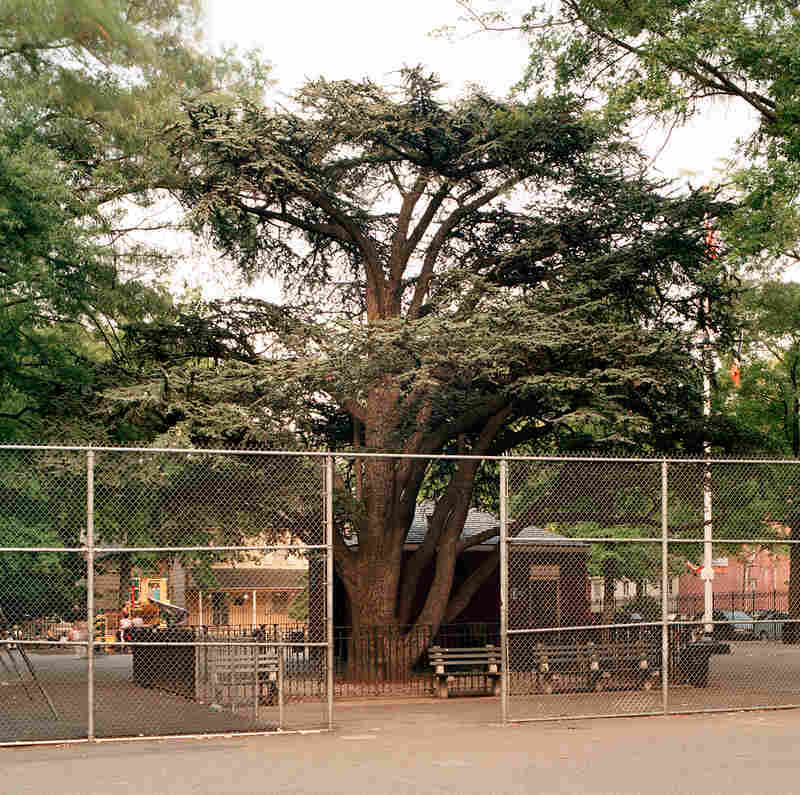 There's a huge cedar of Lebanon that sits within a protected gate in Flushing Queens. It's another tree that is hard to grow in this city, but can live for 1,000 years in the Middle East. In the 19th century, Kissena Park, also in Queens, was a nursery run by the Parson family. Fredrick Law Olmstead and Calvert Vaux got many of the trees they planted in Central and Prospect parks from Kissena. We come across some beautiful Katsura trees in straight rows. This tree originally covered the world, but later survived only in Asia. So why is it now in backyards all over the United States? "In the middle of the 19th century," says Swett, "a consul to Japan, who had been appointed by President Lincoln, sent some seeds back to his brother in Brooklyn." And he passed them on to the Parson family. Swett says trees actually connect people with the city physically. "Each growth layer that they put on every year contains a bit of the air from that year, transformed into carbon, and so the tree physically holds the years and years of the life of the city," he says. And of course trees become part of people's lives, their history and memories. The last tree we look at is back in Manhattan. I have probably passed it 100 times walking through Greenwich Village and Washington Square Park. And like so many, I never noticed it, although it's probably 220 years old, an English elm standing 135 feet high when last measured almost 30 years ago. "This tree, for many years, was known informally around the city as the Hangman's elm because it was thought that during the American Revolution traitors had been hung from one of its long branches that used to sneak out over the nearby street," Swett says. It turns out hangings did not take place on the tree, which was probably planted in the 1790s, but there may have been a gallows nearby. Swett says trees have psychological and emotional meaning that we often don't even realize until one is cut down. And a couple of the trees in his book are already gone.